If you are a music fan, you must be having music turned on your computer most of the time. And it is not always possible go back to your computer to stop the current song when, for instance, you are in the middle of some work. Well, now you don’t have to go all the way back to your computer to stop that song. Just put up your hand towards the webcam and your song will stop. A new app called Flutter helps you to play/pause music or movies with a simple hand gesture. So don’t worry if your media player is lying deep beneath the stack of other windows, you can directly Play or Pause the player using the hand gesture. No need to look for the media player and clicking the pause button. The app uses your webcam to detect your hand gestures. Once it recognizes the right gesture, it sends the appropriate signal to your media player to play/pause playback. 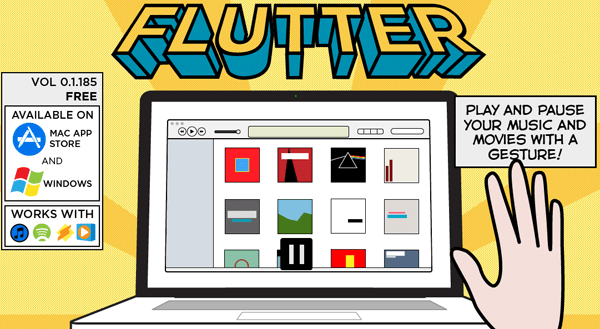 Flutter is available for Windows and Mac and supports media players like iTunes, Spotify, Winamp and Windows Media Player. 1. Connect a webcam to your computer. 2. Download Flutter (Windows 7 and later) and install it. Mac users can download and install Flutter from the Mac App Store. 3. Run the app and a supported media player. The app automatically detects the webcam and waits for it to capture the right gesture. 4. Put up your palm in front of the webcam for 1-2 seconds. Playback should begin automatically. 5. To Pause a currently playing media, use the same gesture again. The app has currently been released in Alpha and supports only gestures for Play and Pause. In the later releases, we hope to see gesture support for more functionalities like the Previous and Next buttons and also adjustment of volume, etc. Anyway, the Flutter app is an innovative program and fun to use.